Crag Care days are generally held from 9:30am to 12:00pm on the 2nd Sunday of every odd month except in May when it is held on the Saturday so it doesn’t clash with Mother’s Day. 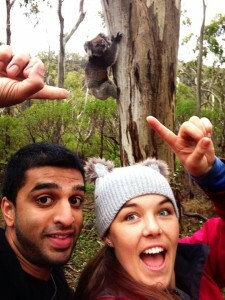 We meet at 9:30am at Gate 15 on Norton Summit Road (the entrance to the Morialta climbing areas) and work till 12:00pm. See Events for the next Crag Care event. What is the Crag Care program all about? As climbers we enjoy the best of the great outdoors, accessing special places that no one else has the skills to venture into, exploring new places and gaining new heights. Along with all this adventuring comes some responsibility, that is the responsibility to keep our crags clean, to tread lightly and do as little damage as possible to our wild places. Even with all these great practices there is still a cost to pay for all our access, we don’t pay it but our local crags do. In many little ways, each time we visit a crag we collect not only our own rubbish but any which has been left behind by others. We hold crag clean up days if they are needed. We help out locals with the removal of environmental weeds and attend planting days. 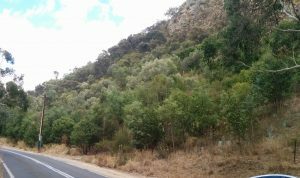 We have developed a good relationship with the 3rd Creek Catchment group and have helped out with the native revegetation below Norton Summit. The great collaboration between the Climbing Club of South Australia and the 3rd Creek Catchment group saw the group winning the Community event award from the Adelaide Hills Council at the Australia Day awards in 2014. 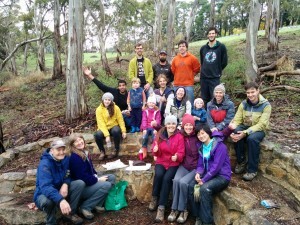 The Climbing Club of South Australia is a member of the Friends of Black Hill and Morialta, as such each financial member of the club is effectively a member of the Friends group. We can attend any of their project sites and help out when needed. We can also attend any of the training days being offered to members. If you are interested in learning more you can check out their website or read their latest newsletter. To register for any training courses contact our Crag Care Co-ordinator (see below). 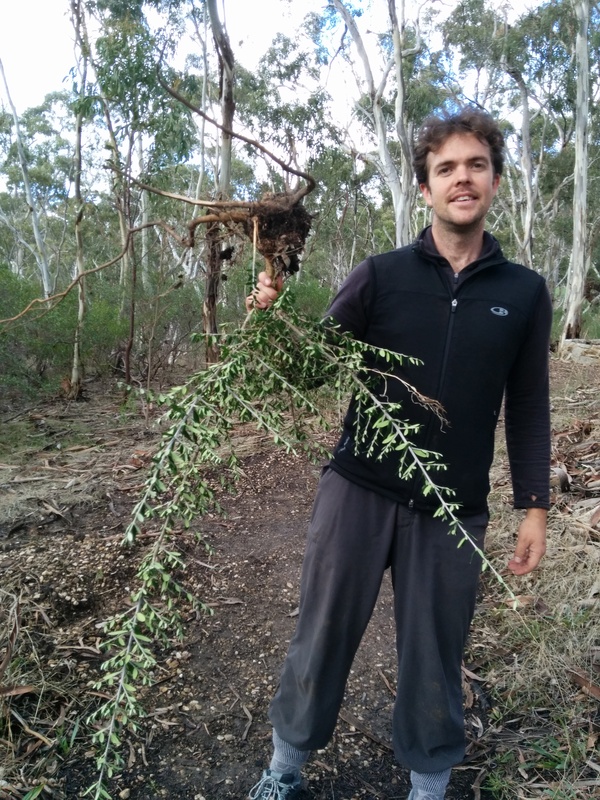 In consultation with the Friends of Black Hill and Morialta and DEWNR the Club adopted a site in the Morialta Conservation park in 2014 and called it the Morialta Crag Care project. The first working bee was held on Mothers Day, May 2014. In 2015 the UniSA Rock Climbing Club joined the Friends group to expand the Morialta Crag Care project and the partnership between the Friends group and all climbers continues to grow. The site encompasses the areas from Billiard Table to Far Crag. All clubs are welcome to join as are individual climbers. We have started on a program of weed control and minor track maintenance. We are hoping to extend that to some more substantial track maintenance and development in the future. Register you interest! Email the CCSA Crag Care co-ordinator. Crag Care days are generally held on the 2nd Sunday of every odd month if it is not raining or extremely hot. 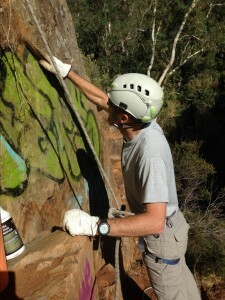 We meet at 9:30am at Gate 15 on Norton Summit Road (the entrance to the Morialta climbing areas) and work till 12:00pm. An afternoon of climbing usually follows so bring your gear and some lunch! We cleared out this much blackberry! 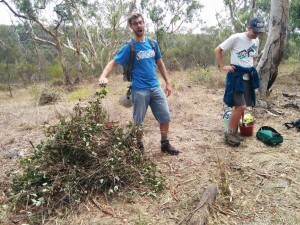 Olives removed from the access track at the first Morialta Crag care day.